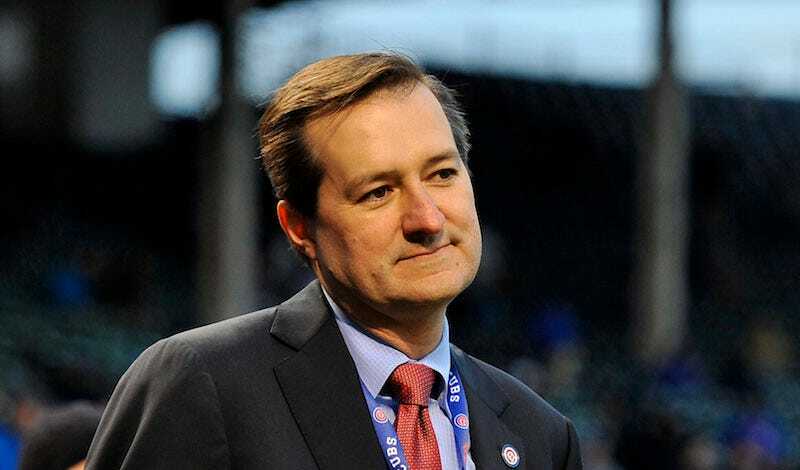 Tom Ricketts Blames His Dad's Islamophobic Emails On "The News Of The Day"
Cubs co-owner Tom Ricketts spoke to reporters today in an effort to once again distance the team from his father and fellow co-owner Joe Ricketts, whose racist email inbox was made public by Splinter earlier this month. Tom also offered a wan defense of his father, which somehow culminated in him blaming his father’s own horrible thoughts on the news. Some of the things that he wrote about Islam, I think, and he put this in his own statement, were colored by the news of the day in the Middle East. And that’s another great point, because we all have to fight very hard not to let that very small percentage of people that are creating all this news, we can’t let that cast a shadow over all the people that aren’t like that. What a great point. We definitely all need to do a better job of not letting “the news of the day” turn us into raving Islamophobes with soup-filled skulls. All of us grown adults who have somehow made it through life without achieving a third-grader’s understanding of how racism and prejudice works definitely need to work harder at not hating all Muslims just because we saw some ISIS guys on Fox News. Being a rich white billionaire with an inbox that bursts with racist jokes and deranged conspiracy theories about how Muslims are going to destroy America is such a universal, and thus totally excusable, experience. Has any sports franchise ever become this detestable in such a short period of time?